Samhain (pronounced Sow-en), dates back to the ancient Celts who lived 2,000 years ago. Contrary to what some believe, is not a celebration of a Celtic god of the dead. Instead, it is a Celtic word meaning "summer's end." The Celts believed that summer came to an end on October 31st and the New Year began on November 1st with the start of winter. But the Celts also followed a lunar calendar and their celebrations began at sunset the night before. Many today see Halloween as the pagan holiday. But that's not really accurate. As the pagan holiday of Samhain is on November 1st. But their celebrations did and still do, start at sunset on October 31st, on Samhain Eve. During the day on October 31st, the fires within the home are extinguished. Often families would engage in a good "fall" cleaning to clear out the old and make way for the new. Starting the winter months with fresh and clean household items. These psychic readings would be conducted with a variety of divination tools. Such as throwing bones, or casting the Celtic Ogham. There is some historical evidence that additional tools of divination were also used. Most of this comes from writings recorded by Roman invaders, but there are stories of reading tea leaves, rocks and twigs, and even simple spiritual communications that today we'd call Channeling. Some historians have suggested that these early people were the first to use tiles made from wood and painted with various images which were the precursor to Tarot Cards. There's no real evidence to support this, but the 'story' of these tiles has lingered for centuries. When the community celebration was over, each family would take a torch or burning ember from the sacred bonfire and return to their own home. The home fires that has been extinguished during the day were re-lit by the flame of the sacred bonfire to help protect the dwelling and it's inhabitants during the coming winter. These fires were kept burning night and day during the next several months. It was believed that if a home lost it's fire, tragedy and troubles would soon follow. Pomona's Day of Honoring, the Roman goddess of fruit and trees. The symbol of Pomona is the apple and the incorporation of this celebration into Samhain probably explains the tradition of "bobbing" for apples that is practiced today on Halloween. With the coming of Christianity in the 800s AD, the early Church in England tried to Christianize the old Celtic festivals. Pope Boniface IV designated the 1st of November as "All Saints Day," honoring saints and martyrs. He also decreed October 31 as "All Hallows Eve", that eventually became Hallow'een. Scholars today widely accept that the Pope was attempting to replace the earlier Celtic pagan festival with a church-sanctioned holiday. As this Christian holiday spread, the name evolved as well. Also called All-hallows Eve or All-hallowmas (from Middle English Alholowmesse meaning All Saints' Day). 200 years later, in 1000 AD, the church made November 2 All Souls' Day, a day to honor the dead. It is celebrated similarly to Samhain, with big bonfires, parades, and dressing up in costumes as saints, angels, and devils. Together, the three celebrations, the eve of All Saints', All Saints', and All Souls' day, are called Hallowmas. Samhain comes from the Gaelic word samain. "Sam" - summer and "fuin" - end. It literally means Summer's End. The early Irish and Brythonic cultures believed the year was divided in half. The dark half and the light half. 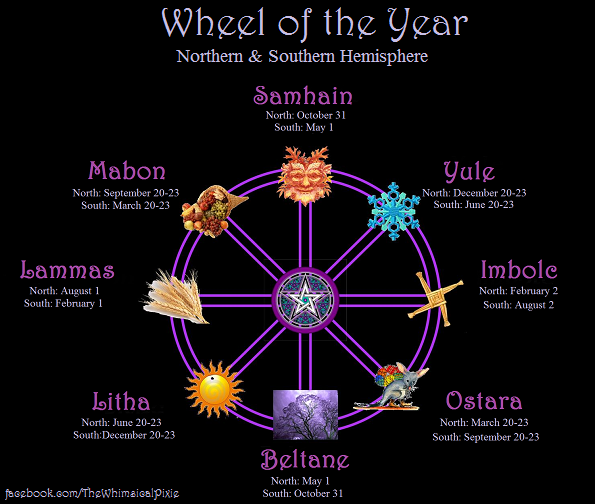 Samhain marked the end of the light half and the beginning of the Celtic new year or the dark half. The confusion of May to November 1st probably comes from the Christians and pagan Roman festivals. The Roman Empire was a pagan culture. During their reign they held many pagan festivals and celebrations, one being the Feast of the Lemures on May 13th. During this time malevolent and restless spirits of the dead were appeased and festival participants would attempt to gain the favor of the spirits. The feast covered a three day period that honored "all the dead" with food, drink and sacrifice. At the same time Pope Boniface IV consecrated the Pantheon at Rome to the Blessed Virgin and all the martyrs. This was celebrated in the west from May 13, 609 to 610. Pope Gregory III (731–741) during an oratory in St. Peter's for the relics "of the holy apostles and of all saints, martyrs and confessors, of all the just made perfect who are at rest throughout the world", moved All Saints Day to November 1. These early similar celebrations come together around 835AD. The Roman pagan festival is over taken by the early Church, the Irish Church conforms it's celebrations with Rome, and everyone seems to move their day of the dead to coincide with early Irish pagans and their celebration of Samhain on November 1st. There's no doubt, however, that the Irish festival of Samhain has always been at the end of summer on November 1st, and has been one of the prominent harvest festivals for Celtic pagans from the past and the present. "Trick-or-treating" is a modern tradition that probably finds it's roots in the early All Souls' Day parades in England. During the festivities, poor citizens would beg for food and families would give them pastries called "soul cakes" in return for their promise to pray for the family's dead relatives. The distribution of soul cakes was encouraged by the church as a way to replace the ancient practice of leaving food and wine for roaming spirits. The practice, which was referred to as "going a-souling" was eventually taken up by children who would visit the houses in their neighborhood and be given ale, food, and money. "Dressing up" for Halloween gets it roots from dressing up around the sacred bonfire during the original Celtic festival. Some suggest, this practice originates from England, when it was believed that ghosts came back to the earthly world on Halloween. People thought that they would encounter ghosts if they left their homes, so to avoid being recognized people would wear masks after dark so that the ghosts would mistake them for fellow spirits. In addition, these early English people, would place bowls of food outside their homes to appease the ghosts and prevent them from attempting to enter or cause harm to their homes. A tradition obviously taken from the ancient Celtic pagans. As the beliefs and customs of different European ethnic groups meshed together a distinctly American version of Halloween began to emerge. The first celebrations included "play parties," public events held to celebrate the harvest, where neighbors would share stories of the dead, tell each other's fortunes, dance, and sing. Colonial Halloween festivities also featured the telling of ghost stories and mischief-making of all kinds. By the middle of the nineteenth century, annual autumn festivities were common, but Halloween was not yet celebrated everywhere in the country. In the second half of the nineteenth century, America entered an age of mysticism. What was more often termed spiritualism. Metaphysical groups and clubs began to spring up throughout the Golden Age and the wealthier set of Americans. At the same time, America was welcoming a new group of immigrants, especially the millions of Irish fleeing Ireland's potato famine of 1846. This new cultural influence brought with it a melding of Irish and English traditions, and a new Americans culture was born. People began to dress up in costumes and go house to house asking for food or money, a practice that eventually became today's "trick-or-treat" tradition. Young women believed that, on Halloween, they could divine the name or appearance of their future husband by doing tricks with yarn, apple parings, or mirrors. The modern celebrations of Halloween do not take away or alter the spiritual significance of Samhain for pagan practitioners. Our Sabbat is still intact and still honored with reverence and in the traditional methods practiced by our ancient pagan ancestors. Though we don't make animal sacrifices any longer, there are some who will toss a steak into a bonfire as a symbolic gesture. The main focus of the holiday for pagans is still to honor our loved ones who have passed on and to share in communication with them during this time when the veil between worlds is narrowed. Fact 9) Traditionally, people would put out offerings and lights for the spirits on their journey. If they didn’t, the spirits would play tricks on them. This is the origin of trick or treating. Barm Brack is a traditional Irish bread with fruit in it. On Samhain people would bake a thimble, a coin, a ring and a scrap of cloth into the bread to foretell the events of the coming year. If you found a thimble in your piece, it meant that you would remain unmarried, a coin meant good fortune was coming to you, a ring meant marriage and a scrap of cloth meant you would be hard up for money. Sieve together the flour, salt, cinnamon, allspice & nutmeg. Cream in butter. In a separate bowl, mix 1 tsp of sugar with yeast. Gently stir in the warmed milk. Beat the eggs and add to the yeast/milk mixture, tempering first. Save out a little egg white for glazing the bread later on. Make a well in the flour mixture and add in the in the yeast mixture & stir for about ten minutes with a wooden spoon. Fold in the raisins, currents & dried fruit. Separately wrap a clean thimble, coin, ring & scrap of cloth in grease proof, baking quality parchment paper, and mix in by hand. Place in a warm bowl, cover with damp cloth and place some warm (like on top of the refrigerator) & allow to rise for an hour or until the dough has doubled in size. Knead lightly & turn into a buttered, floured 8″ cake pan. Allow another 30 minutes & glaze with reserved eggwhite. Bake in over preheated to 400° F, 200° C or gas mark 6, for 45 minutes. Brush with 1 Tbs sugar dissolved in 2 tbs boiling water & return to the oven for 3 minutes. Turn out & cool on a wire cooling rack. Serve thickly sliced with butter. tip- for extra moist raisins, currents and dried fruit place in microwaveable bowl, with just enough water to cover. Microwave on high for about 30 seconds or until plump. Pour off liquid and add to any recipe! Samhain shona dhuit! Happy Samhain to you!